On December 1, 1974, a group of riders showed up at a cyclocross race in Marin County aboard what may have been the first mountain bikes. Then nobody heard from them again, until 1996. Here’s their story. Napoleon Bonaparte once claimed that history was merely fable, and in no other sport do his words ring truer than in mountain biking. What little history there is seems more wrought with speculation than actual fact and its anyone’s guess where the blathering ends and the truth begins. Take, for example, the story of the Cupertino Riders. On December 1,1974, mountain bike pioneers Charlie Kelly, Joe Breeze and Gary Fisher packed up their cyclocross bikes and headed to the West Coast Cyclocross Championships in Mill Valley, California. Contrary to the lofty title, this wasn’t an incredibly important event in the annals of cycling. Twenty-six riders took part that day, and after twenty laps, the race was won by less-than-legendary Lawrence Malone. But something historic did occur that day and, as the story goes, it happened before Kelly, Breeze and Fisher even left the starting line. The three glimpsed a pod of riders with radically evolved fat-tire bikes, something never seen before. For years, the legend of the Cupertino Riders has been passed from ear to ear by well-meaning rumormongers, but because the group disappeared immediately following the race, for two decades there was no source to confirm or deny its existence. It was as if the Cupertino Riders had been snatched from the future and returned from whence they came. The reason it’s difficult to discern the truth behind the story is that the Riders’ existence may actually discount other portions of mountain biking’s history; if the story is true, based solely on timeline, the people who claim to have created the first mountain bike may have been a step behind this crew. Surely, the ongoing spat between the Marin pioneers could have fueled such a plot to discredit one another. But the truth is, the Cupertino Riders did exist. As odd as this story is, the Riders’ reentry into the world of mountain biking came under even stranger circumstances. In 1994, Tom Ritchey was in the process of having a foundation poured for his home, when the contractor noticed numerous mountain bikes lying around. The builder told Ritchey that he personally knew the first person to install a derailleur on a fat-tire bike. Ritchey, nonplussed by the man’s claim initially dismissed the notion, thinking he was simply one of thousands who chanced across Gary Fisher. But the builder said the person was Russ Mahon, at which point Ritchey discredited the person’s story altogether. After all, Mahon wasn’t a household name in mountain biking. You can imagine Ritchey’s surprise when a year later an envelope arrived at his house from a man calling himself Russ Mahon. Packed with the photos of the original group of riders chumming it up, as well as a photo of Fisher looking back at Mahon and his balloon bike, the parcel altered Ritchey’s skepticism quickly. Ritchey called Breeze, who was particularly thrilled with the find, especially in light of the fact that only a year or two earlier; Breeze had given up his search for the elusive band. Finally, the means were available to turn fable into fact. 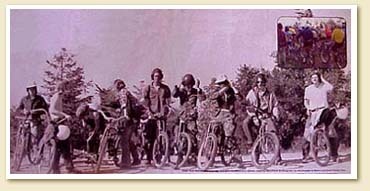 In 1974 the Morrow Dirt Club consisted of ten riders who met weekly to bomb down fire roads in Cupertino, California. The name Morrow derives from the Morrow coaster brake, which was made by Bendix and saw heavy use by both the Klunkers in Marin and the Cupertino Riders. The West Coast Open Cyclocross Championships allowed riders to race any bike, which is the main reason the Morrow Dirt Club showed up. Russ Mahon the leader of the club and our link, road a 26-inch-wheel Ward’s Hawthorne equipped with derailleurs that provided 10-speeds, a longhorn handlebar and front and rear drum brakes. Since this race wasn’t just a downhill run, Mahon removed the typical springer fork in favor of a rigid fork (the lighter fork also helped keep overall bike weight below 35 pounds). Such a bicycle sounds arcane in light of today’s technological accomplishments, but at the time Mahon and the other riders were doing something quite revolutionary. For Breeze and Kelly, this was the first time a derailleur had been seen on a balloon-tire bike and the thumbshifters and handlebars were equally forward thinking. But Mahon and his crew hadn’t put much thought into it. “ I was just trying to get out there and have some fun, and what we were doing seemed obvious,” Mahon says. The Morrow Dirt Club was short-lived; soon after that day in December, many of the group’s members moved away from Cupertino. By the end of 1975 they had all relocated to different parts of the state. This didn’t stop the dirt riding, of course (Mahon continues to ride off-road to this day), but the weekly meetings, bomber runs down the Cupertino foothills and camaraderie ended less than two years after the Club originally formed. Mahon is quick to add; “I don’t think it would be to hard to find someone who put a derailleur on a balloon bike before me.” Even so, there’s no denying that the Riders influenced the future of off-road cycling, a fact that was reinforced by their induction into the Mountain Bike Hall of Fame in 1996.